Russia and the US have agreed on a new ceasefire plan on Syria that includes a ban on government airstrikes in certain areas and cooperation on strikes against jihadists, Russian FM Sergey Lavrov announced after the marathon talks with the US’s John Kerry. Opening the much-awaited press conference after some 13 hours of talks, Kerry said that the two have agreed on a comprehensive approach to Syrian reconciliation. He called "on every Syrian stakeholder to support the plan that the United States and Russia have reached, to ... bring this catastrophic conflict to the quickest possible end through a political process." Kerry also outlined an establishment of the Russian-US Joint Implementation Centre (JIG) that would serve the purpose of “delineation of territories controlled by Al-Nusra and opposition groups in the area of active hostilities." The first step toward the implementation of this clause will be a 48-hour ceasefire in Syria, Lavrov said. 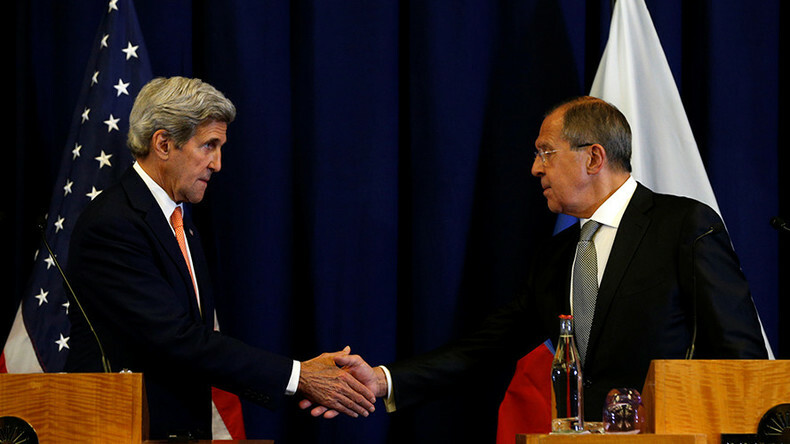 Lavrov elaborated that the ceasefire comes into effect on September 12 and should last for at least seven days. “After the ceasefire regime will be in effect for seven days, we will establish an implementation centre, in which the military and the representatives of Russian and US intelligence will handle practical issues, separating terrorists and opposition,” he added. The Russian FM said that the diplomats have negotiated on five separate documents at the talks. “Despite the mistrust and attempt to disrupt what we have agreed upon, we managed to work out a package of documents, there are five of them. It allows us to set an effective coordination in the fight against terrorism, to expand the humanitarian access to distressed population, first and foremost in Aleppo,” Lavrov said. Due to the sensitive nature of the information contained in the agreements, they will not be made available to general public, Lavrov said. According to the agreement, both Syrian government and opposition forces will “be required to provide safe, unhindered and sustainable humanitarian, commercial and civilian access to eastern and western Aleppo,” Kerry said. Rebels are actively preventing the safe passage of humanitarian aid to civilians in Aleppo, Lavrov said, adding that opposition groups stationed there are threatening to attack Russian humanitarian convoys. "The convoy was ready to go on August 26. But the opposition said that any convoy going down the Castello highway will be shelled," he said. On Friday, seven people, mostly women and children, were killed and at least 24 injured in a terrorist attack on northern Aleppo after militants fired a missile in the area, according to Syria’s state SANA news agency. Lavrov emphasized the importance of all opposition groups being included in the negotiations for the reconciliation process to succeed. “It is the demand of the UN Security Council. Resolution 2254 proclaims that the negotiations should be inclusive, with participation of all Syrian parties, including the groups that have been formed in Moscow, Cairo, El-Riyadh and other places,” he said. The minister added that there were provocations by some unspecified countries that aimed to portray one of the groups as the only legitimate representative of Syrian opposition at the talks. Meanwhile, political analyst Ammar Waqqaf has cast doubt on the sincerity of Kerry’s assertion that “going on Al-Nusra” was never a negotiating point. “United States have made a big decision in ditching Jabhat Al-Nusra to preserve the other fighting groups, the other what they call the moderate fighting groups,” the analyst told RT, calling it the “cornerstone” of the deal. Waqqaf is sure that Washington’s move was prompted by the rapid advance of Syrian armed forces on rebel positions, which would have imminently led to the “severe deterioration” of the so-called moderate forces and hardline terrorist groups, including Al-Nusra, alike. The decision to turn away from the most radical groups was made “to try and tie the Syrian state hand and Russian hand, in order to preserve the other groups who are less extremist but still extremist but they would call them moderate know,” to preserve less extremist rebels. The recent Al-Nusra rebranding when the militant group formally severed all ties with Al-Qaeda and changed its name to Jabhat Fateh al-Sham could have resulted in its inclusion into the moderate opposition if Washington had not strived to find a compromise with Russia, Waqqaf said. For its part, the Saudi-backed High Negotiating Committee (HNC) issued a statement welcoming the split and encouraging the former Al-Nusra group to commit to further reforms.